Week 1 – starting 31st of January. 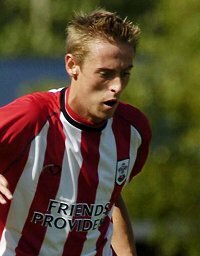 This week my footballer of the week is Peter Crouch who you may have heard scored the last gasp penalty in the F.A.Cup 4th round derby between Southampton and Portsmouth. Since the 6ft 6 striker joined saints for ‘2million pounds in July he has scored 7 goals in 9 starts and 9 sub appearances. After the departure of James Beattie to Everton on January the 4th Crouch has been given more of chance. He has started a superb partnership with Kevin Phillips which has produced a great amount of goals. But 2 weeks ago Kevin Phillips picked up a nasty injury. Manager Harry Redknapp experimented with a new 4-5-1 formation with Crouch playing up front on his own. So far that has worked amazingly, the Saints side are full of confidence after winning their last two games against Liverpool and Portsmouth, Crouch scored goals in both of those games and at this minute is a Saints legend to many fans.